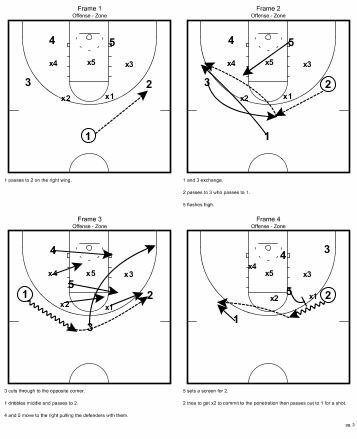 This playbook has three zone set plays from Gonzaga Head Coach Mark Few. Few has been a consistent force in the northwest having coached at Gonzaga since 1989. He started as a graduate assistant that year and was then an assistant coach from 1990-1999. He took over as the head coach in 1999 winning 26 games his first year. He hasn’t had a season with less than 23 wins in his 17 years leading the Zags, and he has a 466-111 overall record. Few has helped the small, private school in Spokane turn into a national powerhouse with 17 NCAA Tournament appearances. He has made 14 rounds of 32 and 6 Sweet 16’s. His Bulldogs made the Elite 8 in 2015. 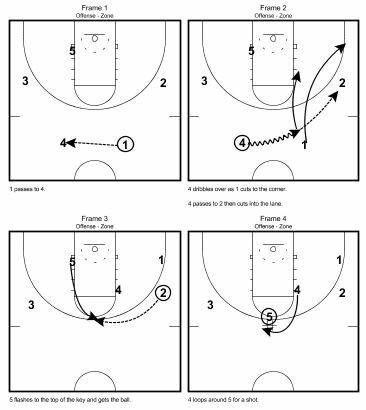 The Mark Few Gonzaga Playbook has some zone sets that Few uses. The Bulldogs ran this zone set in the NCAA Tournament and looked to get a quick dive to the block by Sabonis (Frame 1). If 5 isn’t open, 1 passes out to 3 on the perimeter. 1 then cuts to the corner. If x3 helps on 4, 1 may be open in the corner for a shot. If not, the team goes into zone offense. Gonzaga overloads the right side of the floor with this play and then sets a screen in the slot allowing 2 to drive left. 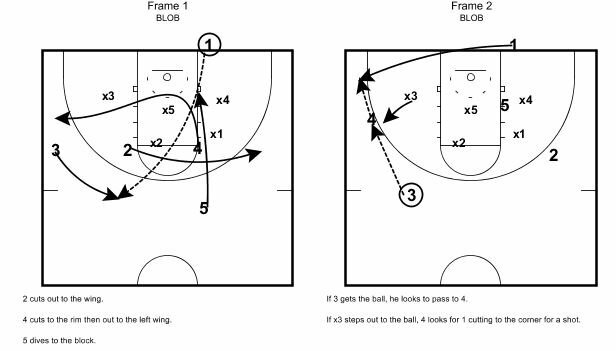 x2 has to help on the drive by 2 leaving 1 open on the wing for a shot. If x4 tries to jump out to the wing it leaves 4 open cutting to the left block. Wiltjer liked this play to get a shot at the top of the key against zone defenses. 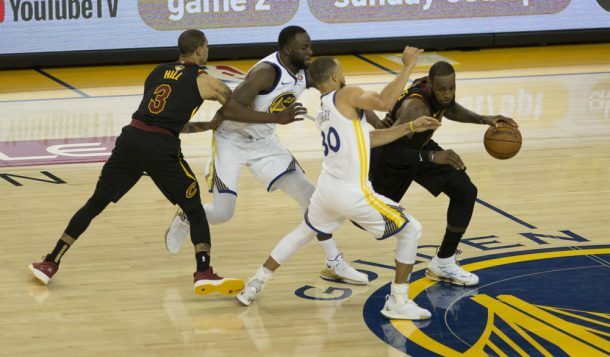 The ball gets to the high post and the bigs go into a dribble handoff for a shot.